If you remember this post, living anyway, you might remember reading in the comments that Allen mentioned that he’d like to see the view from up there. Well, these photos are not from exactly up there, but they’re from a location that’s pretty close to being up there…. You’ll notice that the pictures in first to fourth order go from left to right in the landscape…and you’ll notice that it’s a little brown and bleak…but the photos were taken in November after an earlier light winter and dry summer…. 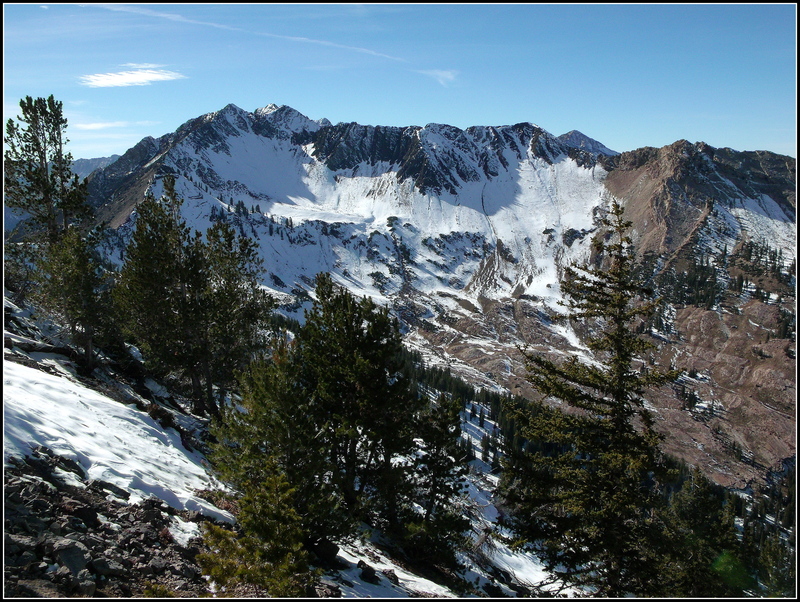 The photos were taken on the ridge between Days Fork and Cardiff Fork, looking west and down into Cardiff Fork. 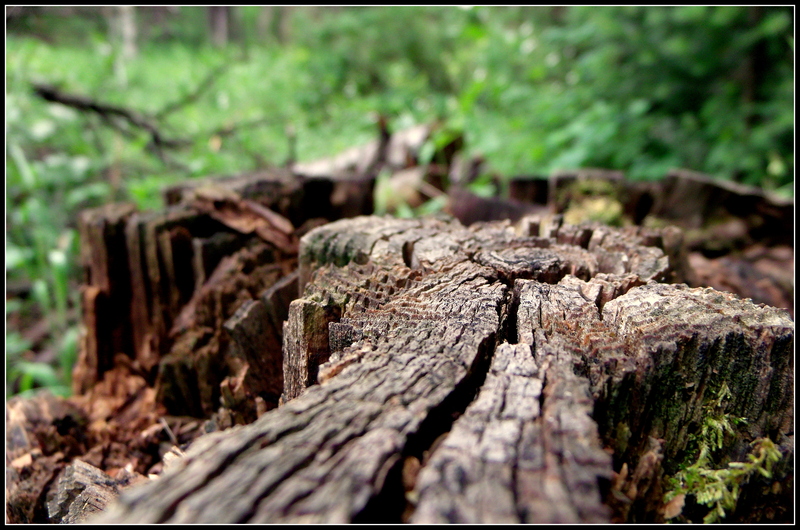 The road was used for mining efforts over the years…which have been finished for about four decades. 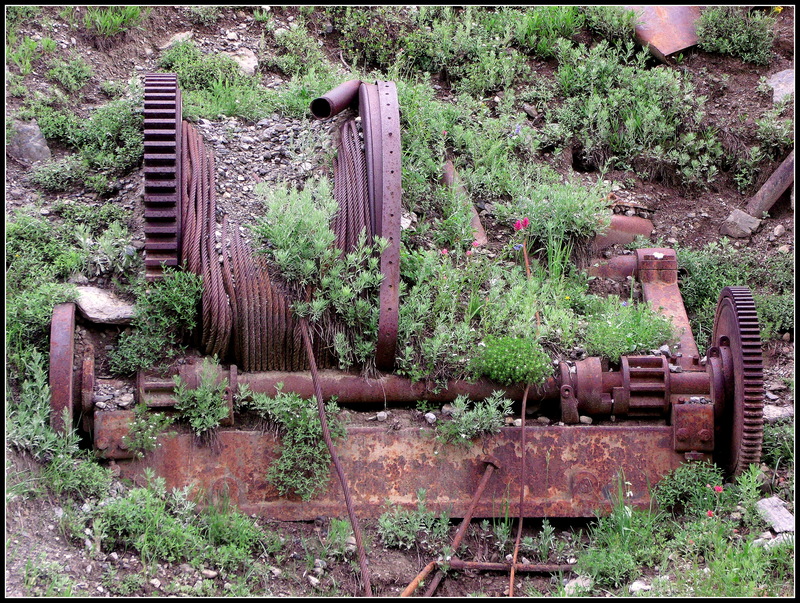 I have photos of the mining artifacts from earlier in the summer…just haven’t gotten around to making a post yet…. If you’ll look closely (or click on the photo to magnify it) in the second photo, at the largest patch of snow closest to the bottom right-hand corner of the image, you can see a small rectangle…that’s the foundation remaining from the miners’ bunk house…you can also see it in the third photograph…but you might have to hunt for it a little bit…in the lower quarter of the image and toward the left side…. 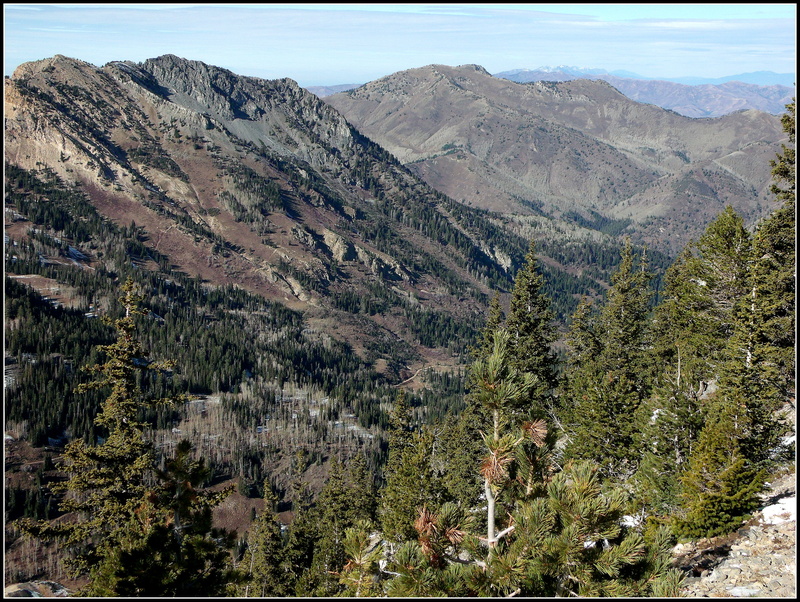 This is another view from my perch on the slice of mountain that exists between Days Fork and Cardiff Fork…what I believe is called the Reed and Benson Ridge…looking toward the left, or east, of the panorama that you can see in the recent post, My Mountains. 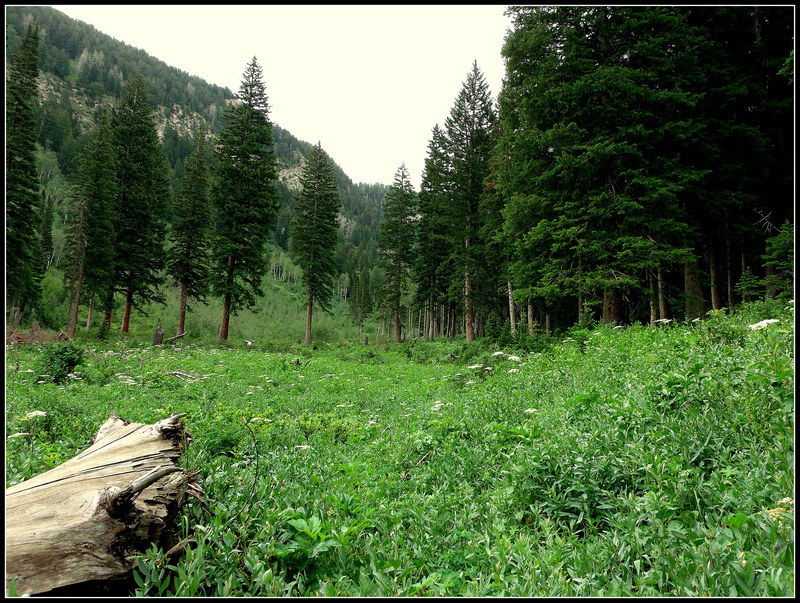 Again, this gorgeous area is found in Big Cottonwood Canyon, part of the Wasatch Mountains that form the eastern boundary for the greater Salt Lake Valley. There is much that we simply cannot see when we are down in the valleys and canyons of the mountains that surround us…however…when we find ourselves perched atop a ridge-line or peak, it is almost as if the world has been opened for us and we can see…and see. I found myself atop the ridge-line between Days Fork and Cardiff Fork a couple of weekends ago…and almost could not believe the view. 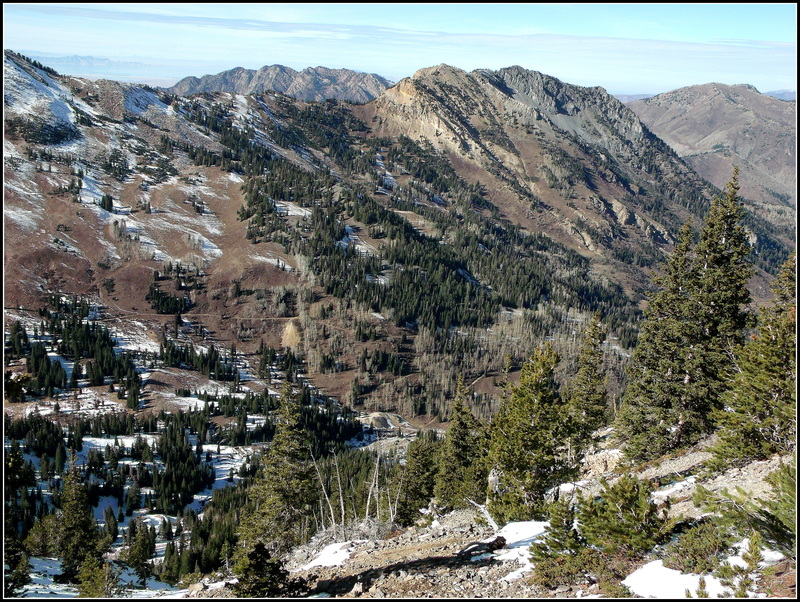 These are some of the various peaks that comprise our Wasatch Mountains…the eastern border for the greater Salt Lake Valley. 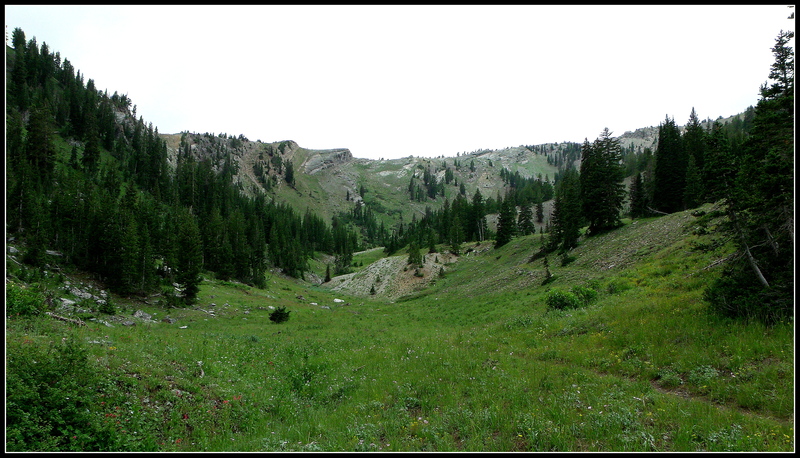 This is the final post in a series in which I have shared my hike up into Days Fork Canyon, another of the tributary canyons that extend off of Big Cottonwood Canyon, just east of Salt Lake City, Utah, USA. 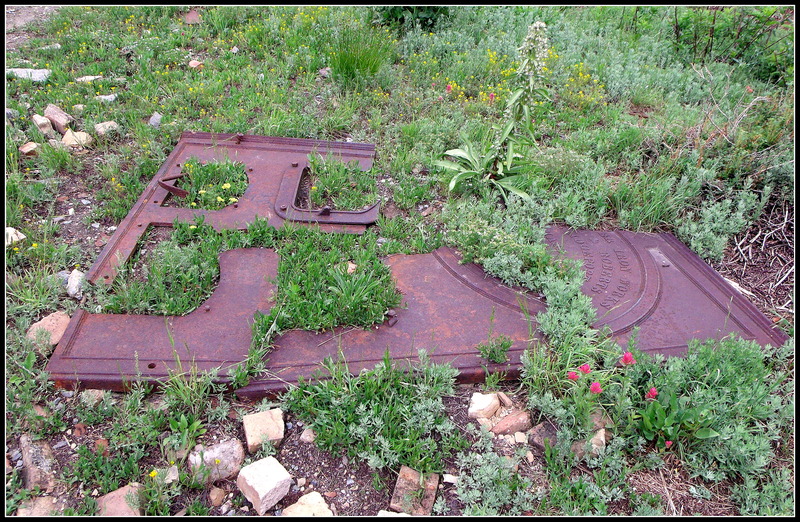 I’m not sure what this large piece of iron might have been during the mine’s operation, but it remains with us in its multiple pieces, somehow resembling a face-plate for a piece of machinery…brought west from Bridgeport, Massachusetts, in whatever year. 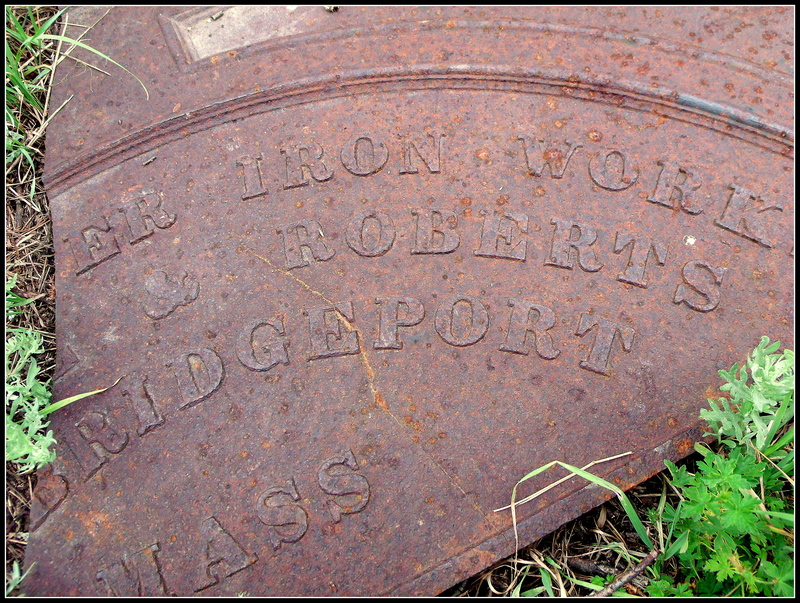 I have Googled “iron works Massachusetts” and have found a bit of information, but nothing with “Roberts” in a company’s name…so who knows what this is or might have been. 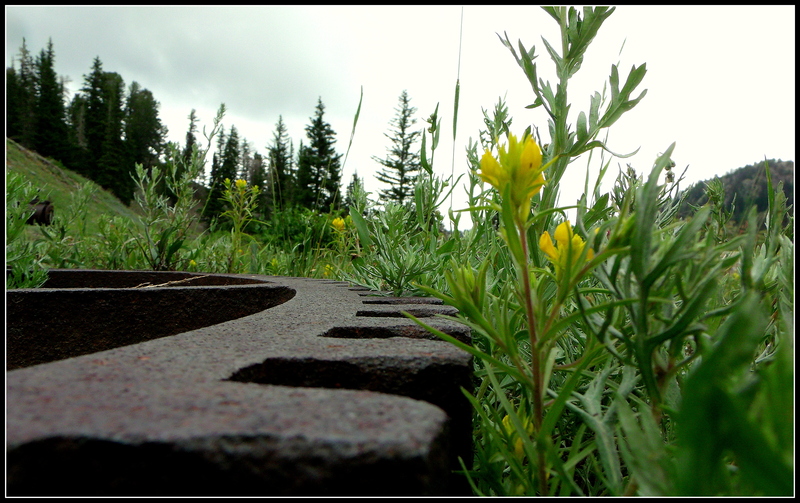 Another hiker has made a stack of remnant bricks atop the machinery, telling those who follow that this is part of the trail…. 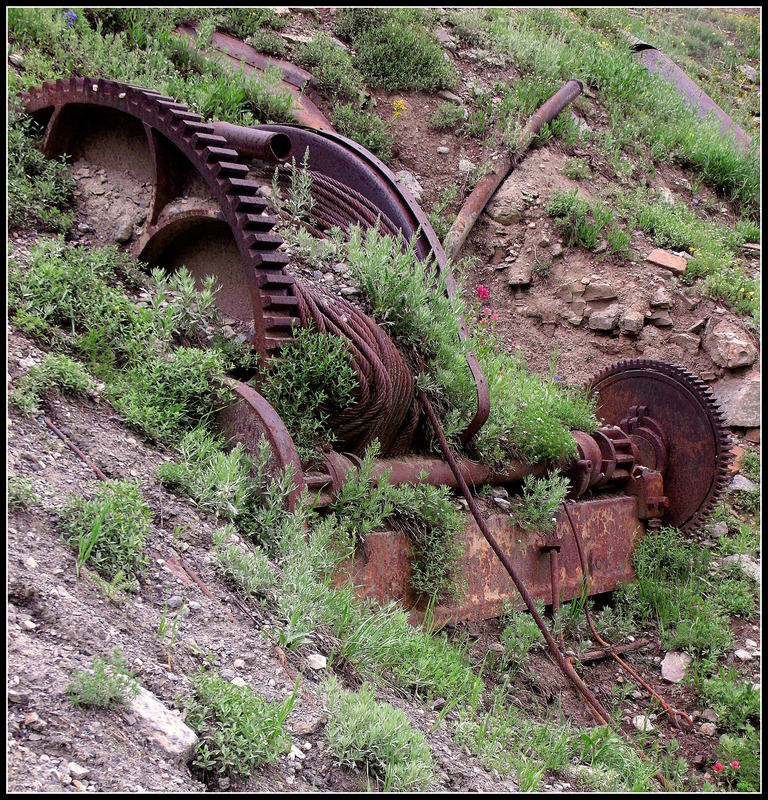 The hillside has begun to slide and cover the hoist…and the mine is slowly swallowing one of the remaining boilers…. 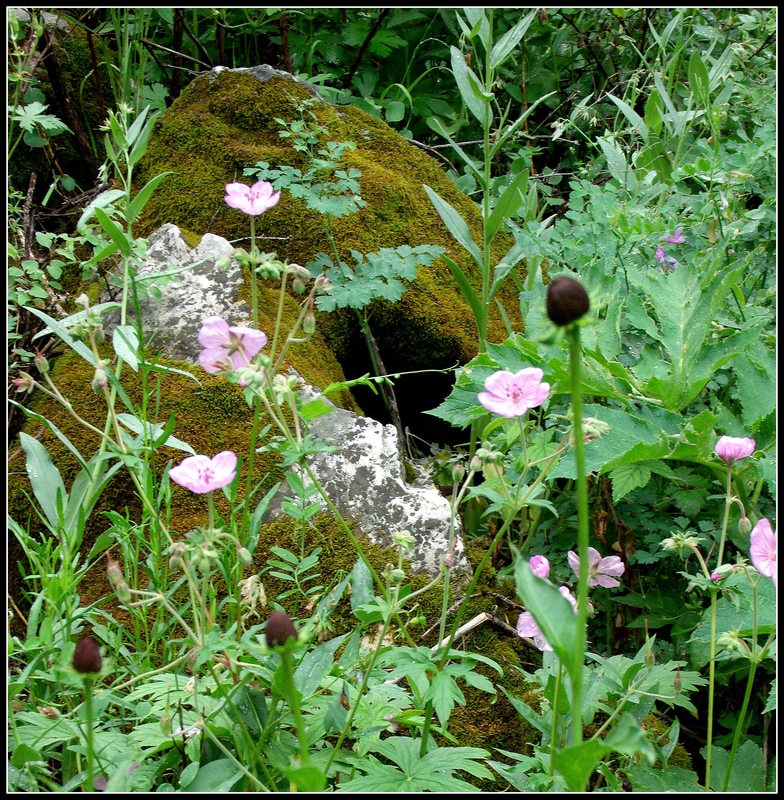 I like the rich colors of earth and rust and the greening of Life that wants to take back what is hers…with a touch of pink on the Indian Paintbrush nearby…. 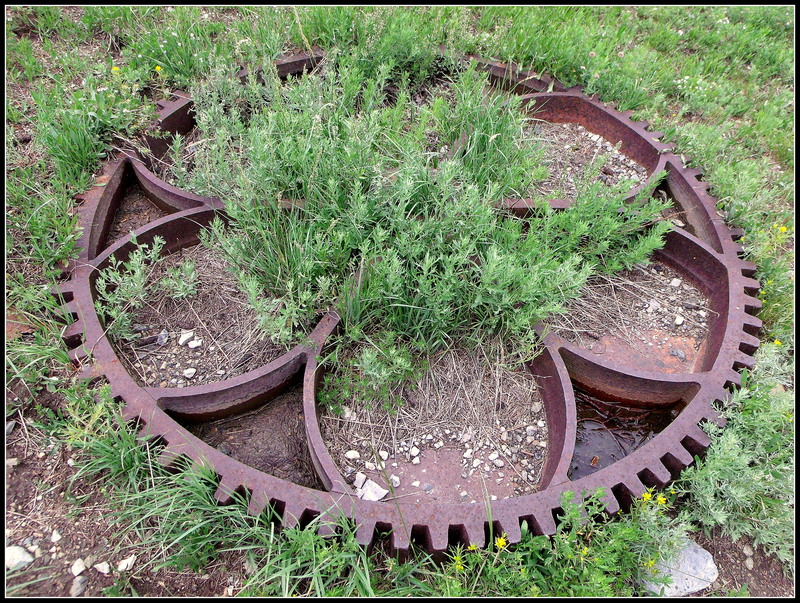 I don’t know the proper name of this petalled piece of cog-ware, but we can see its former function in the third photo below this one…as it appears to have a twin on the left side of the hoist that is also pictured above. 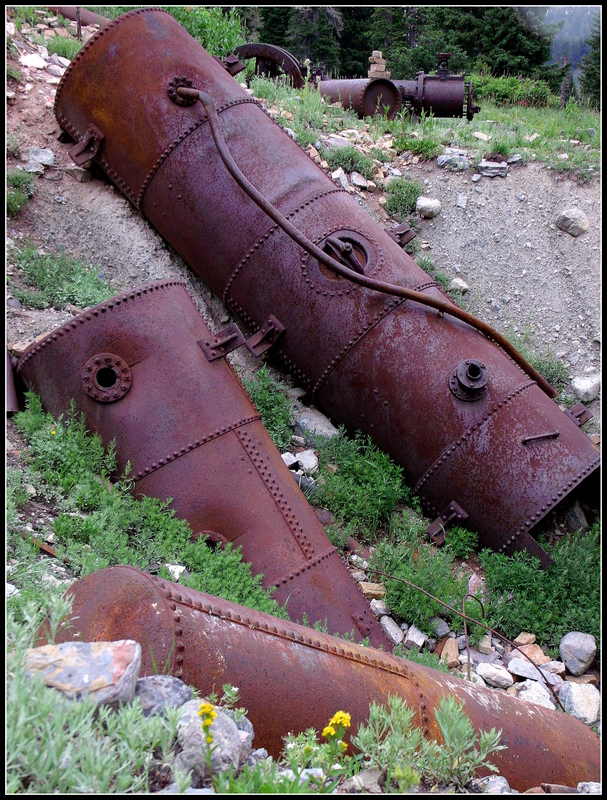 Empty boilers that have seen more productive days…. The trail continues to the left of the area shown in these photos. It goes for another quarter of a mile or so into the terminus of the Fork…a sort of bowl-shaped dead-end that is littered with rocks and trees…and has some other mining tailing-piles up on the surrounding hills. This is the last picture I took of the area, below, as the clouds that had been moving in my direction all morning had started to sprinkle and then rain. 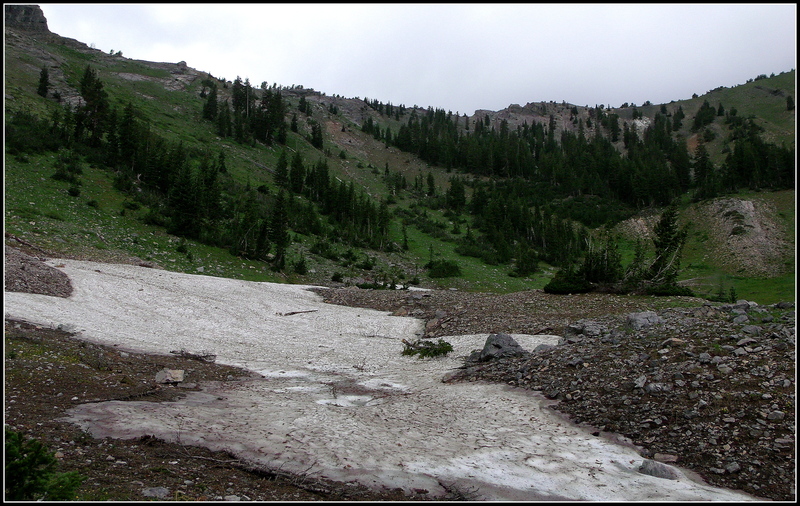 I think it might have been just as well, though, because as I ventured further above the remaining snow and onto the lower portion, and then to the right on that slope you see in almost the dead center of the photograph, I had a feeling of sadness come over me and rather lost the desire to take any more photos. I think the melancholy was due to witnessing the remaining damage that had been caused by our forebears’ attempts at industry…bare hillsides that must have been pristine and thriving forests before their arrival. I don’t know how long the mining operations continued in the area after the burning of the Eclipse Mine in 1888, but if they were to have stopped immediately after that incident, this area would have had/has had approximately 124 years to recover. Yes, we can see that Nature has begun to reclaim what is hers by slowly swallowing the boilers and with the hillside sliding down to envelope the hoist, but it seems like it’s going to take quite a long time before we can no longer see traces of ourselves out there. 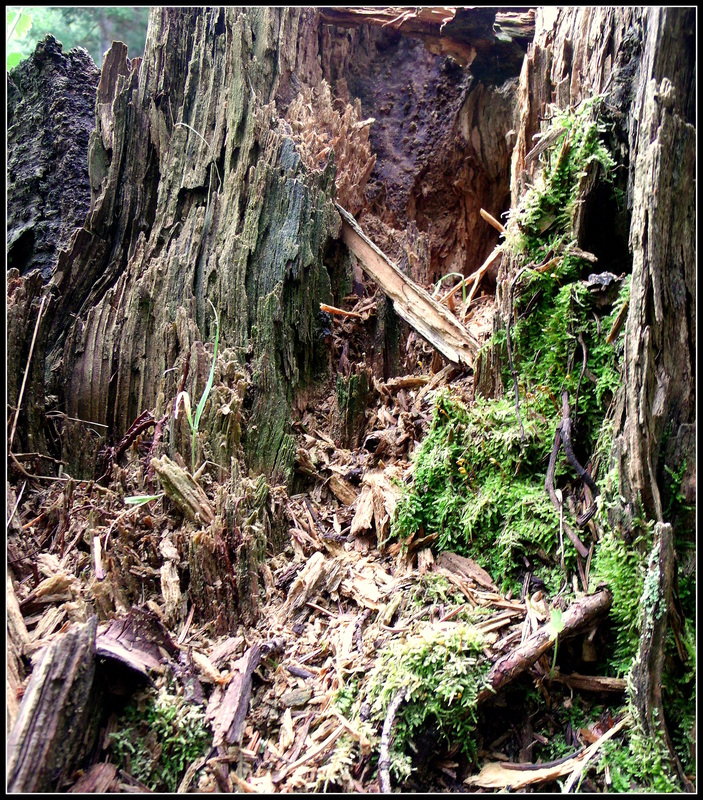 We have the ability to obliterate forests in a couple of years…but they will take hundreds more to return on their own. If you’d like to visit the two earlier posts, Days Fork – I and Days Fork – II, just click on their highlighted names to do so. Thank you for stopping-by and spending a bit of time with me. I hope you’ve enjoyed the hike…. This photo picks-up exactly where we left of in the earlier post, Days Fork I…the image is only slightly different, providing just a touch of another perspective…anyway, here we are, heading toward the mine near the end of the road/trail…and we are enjoying the journey…because that’s what it’s all about…. I think I turned around and looked behind me more on this hike than I have on most others. 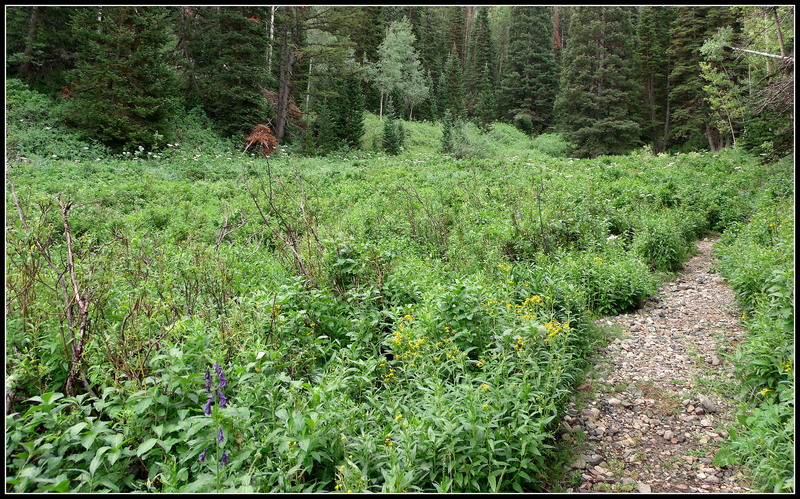 This is the only trail that I’ve been on in the Wasatch Mountain canyons that border Salt Lake City where I’ve seen a sign warning that this was BEAR COUNTRY. The sign was posted in the Spruce’s Campground area where the Days Fork trail actually starts. 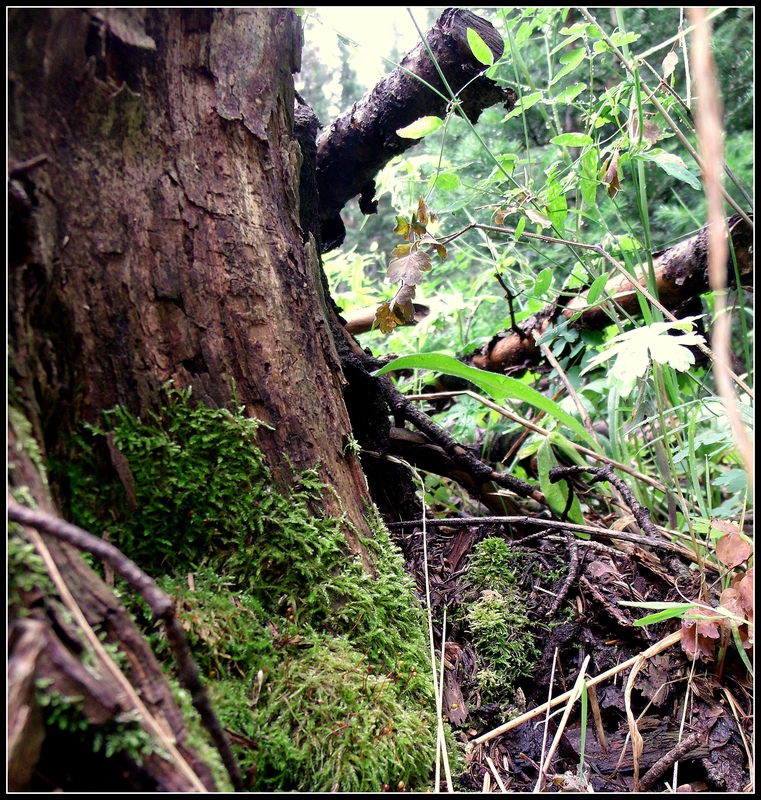 So it was a little freaky for a bit of the hike, especially walking on the trail that skirted the woods…and then went into the meadow…and then skirted the woods again. I was trying to imagine where I would be more likely to see one…would it be in the open meadow, on the mostly clear hillside, similar to where I saw the moose in Cardiff Fork…or would it be in the thicker pine woods…? I mentioned all of that to say that this is a shot of my back-trail. The tree in the immediate right foreground is the same smaller tree that you saw in the above photo, just to the left of center. 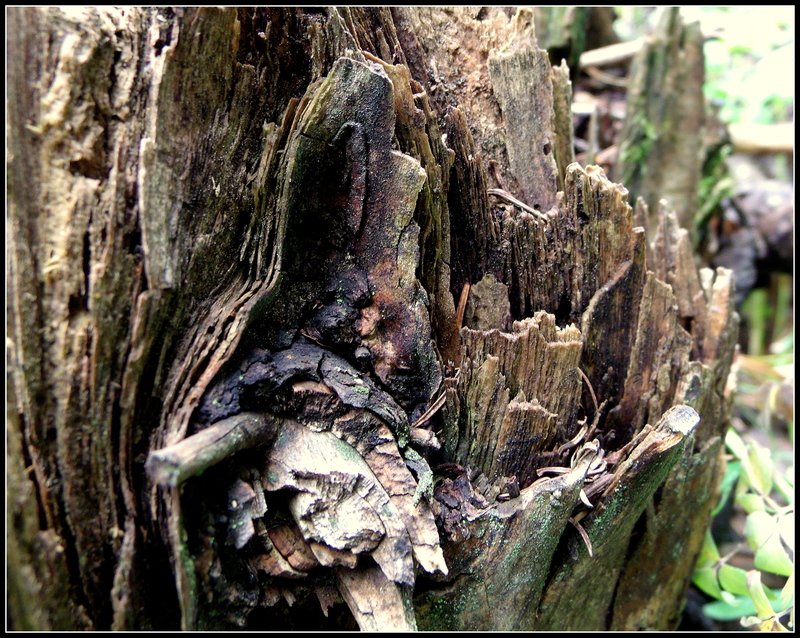 And the beautifully textured bark in this photo is from the tree that you can see to the left of the trail in the above picture…. This almost looks like some of the red rocks that one can see in Kanab, Utah…or in Bryce Canyon and Zion National Forest in the southern part of our state. If you’d like to see some beautiful photographs of those last two areas, stop-by for a visit with Kerry Liebowitz at his Lightscapes Nature Photography Blog. He just completed a series of his twelve-day photo-excursion to southern Utah and northern Nevada…stunning photography. 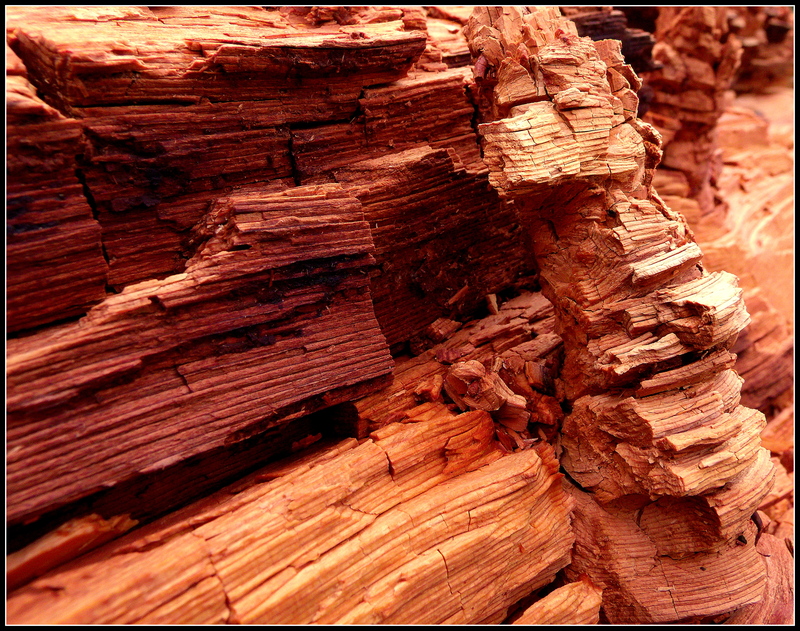 The below photo is my version of a red-rock canyon wall…but from the inside of a decaying tree stump…. 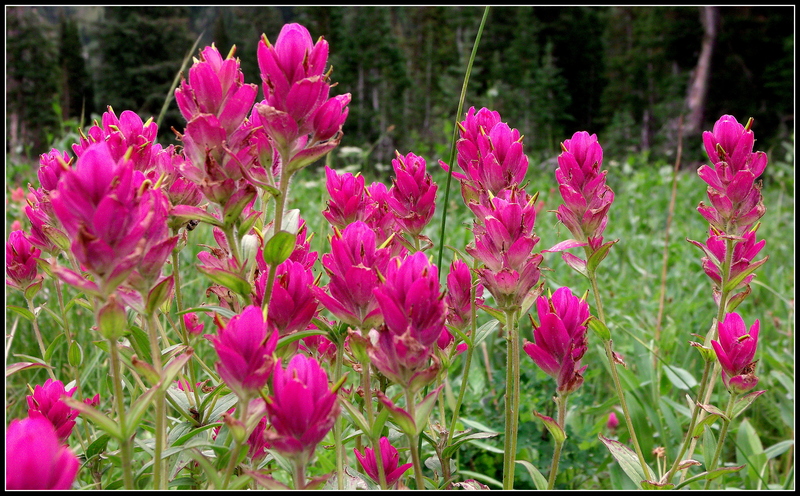 Indian Paintbrush flowers come in at least two varieties here in our Utah mountains…this wide-petalled version and another with more spikey petals. I’ve noticed the spikey version at higher altitudes than the other…. Wikipedia says that there are around 200 species of the flower, ranging from Alaska down to the Andes Mountains in South America, as well as in northern Asia and Siberia…. 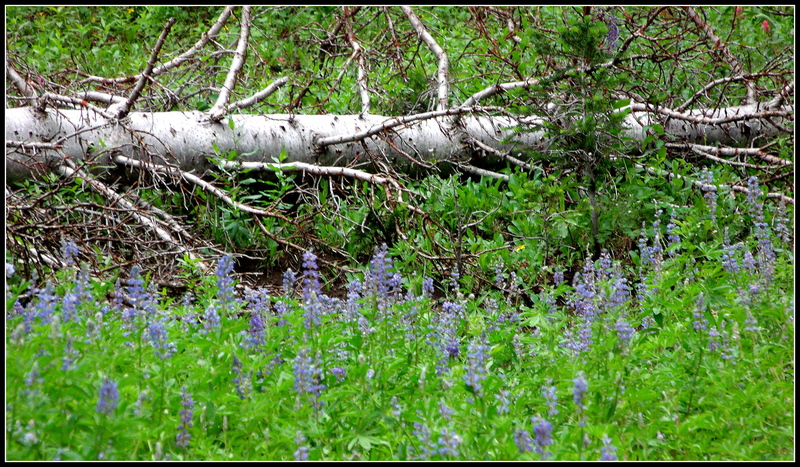 I want to say that this is a White Pine laying in a bed of Lupine, but I could be wrong on both counts…. 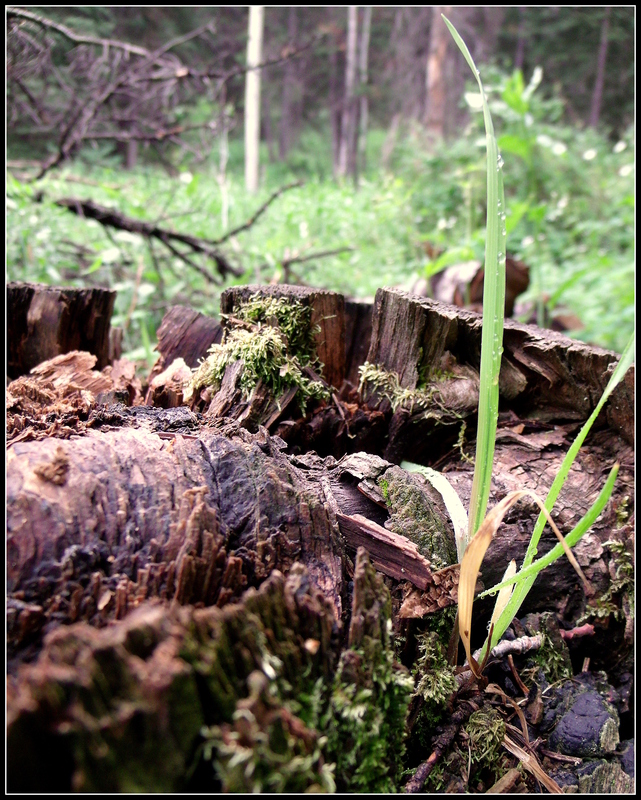 Whatever they are, they struck me as beautiful…and notice the “baby” pine tree tucked against the side of the downed tree…more of that fascinating circle-of-life stuff. I would say that this was essentially the first sign of the mine after I rounded a bend and came up the hill a bit…. You can see the pile of tailings there in the middle of the photo. It’s my understanding that all of that dirt and rock came out of the mountain, shovel-full piled upon shovel-full and after a bit, it became a platform upon which the men worked as they dug their mine…or in this case, dug a shaft a couple of hundred feet down to a tunnel that had already been dug into the area from the other side of the ridge. Remains of something…maybe just a retaining wall to prevent the earth from spilling back down onto the now almost non-existent road. In his book, The Lady in the Ore Bucket, author Charles L. Keller tells us that mining activities were conducted in Days Fork for many years. 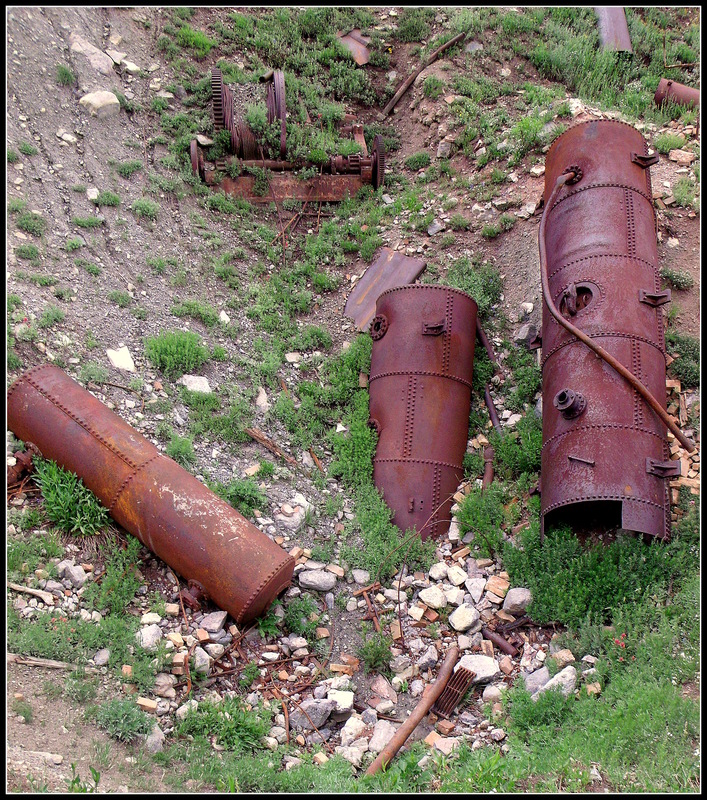 He also mentions that the “best-known remnant from those days is the remains of the Eclipse Mine” (p. 205)…the rusted contraptions of what-not that we can see in the following photos. While there was something about all of this that I found (and still find) incredibly fascinating and interesting, I still had the thoughts going through my head about why it was all still out there…. It struck me as being analogous to “space junk,” all of our left-over pioneer, trail-blazing garbage that we just didn’t want to drag back home with us. But then I kept taking pictures, and kept walking around, kept getting eye-ball-close to the tangible remains of a history that helped make the place what it is today. 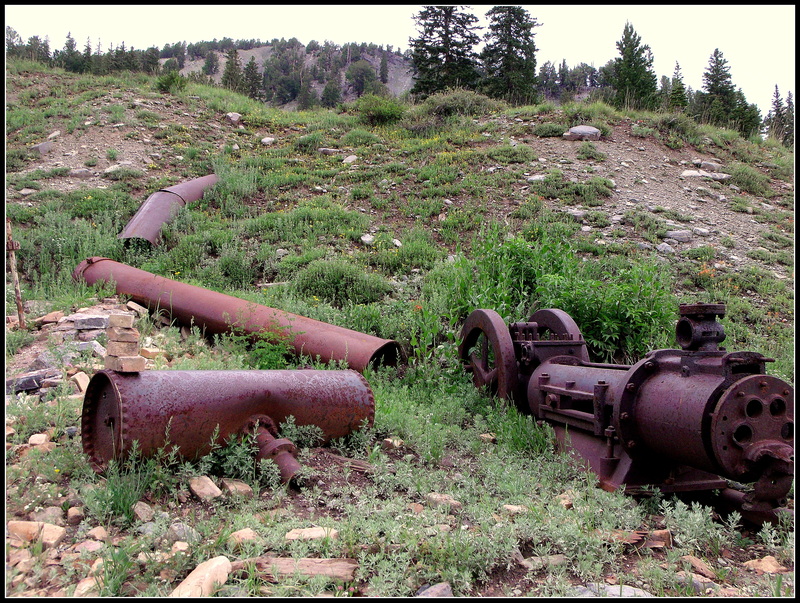 Keller said that the mine operated from late 1877 until early 1888 when it was reported to have burned to the ground…nothing remained but what you see in the photos of this and the next post, along with some huge timbers and cord-wood that managed to return to the earth in one fashion or another. 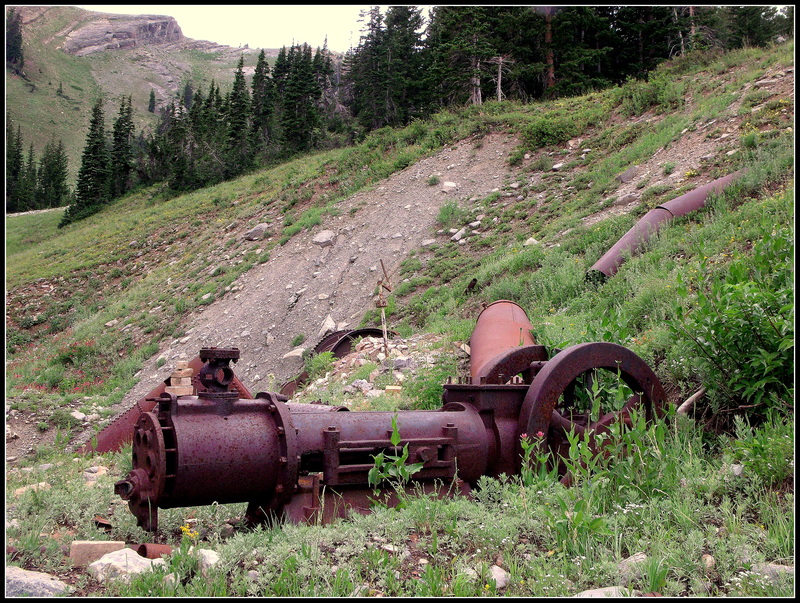 I understand that these are the remains of the hoist motor that lowered lumber and supplies down into the tunnels that connected with those of the Flagstaff Mine that was being operated on the other side of the ridge that you can see in the background. Within a couple of years of this mine’s discovery and subsequent addition to the other mine’s tunnel complex, about 10 tons of ore were being extracted from this mine per day…none of it came up this shaft and out through Days Fork, but it was extracted from this mine. 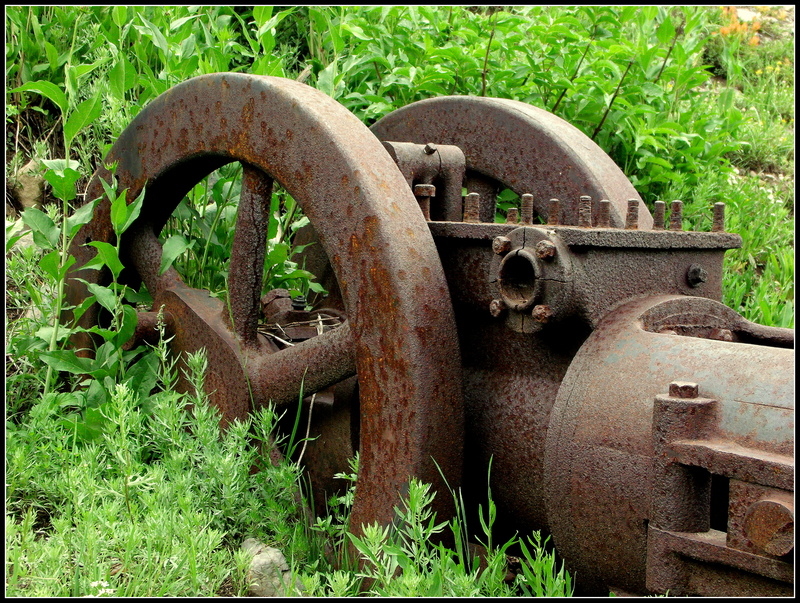 Below is another view of the hoist motor (probably/maybe? 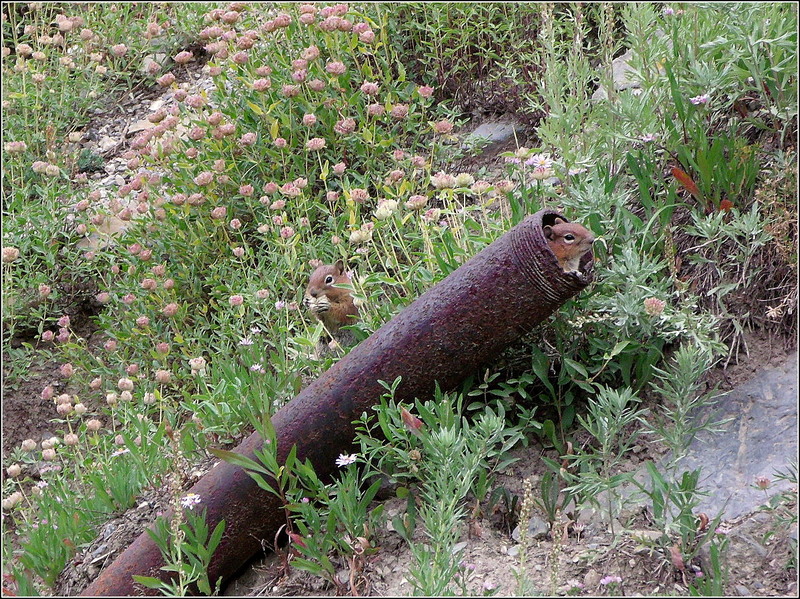 ), one of the three remaining boilers, and some miscellaneous pipe. 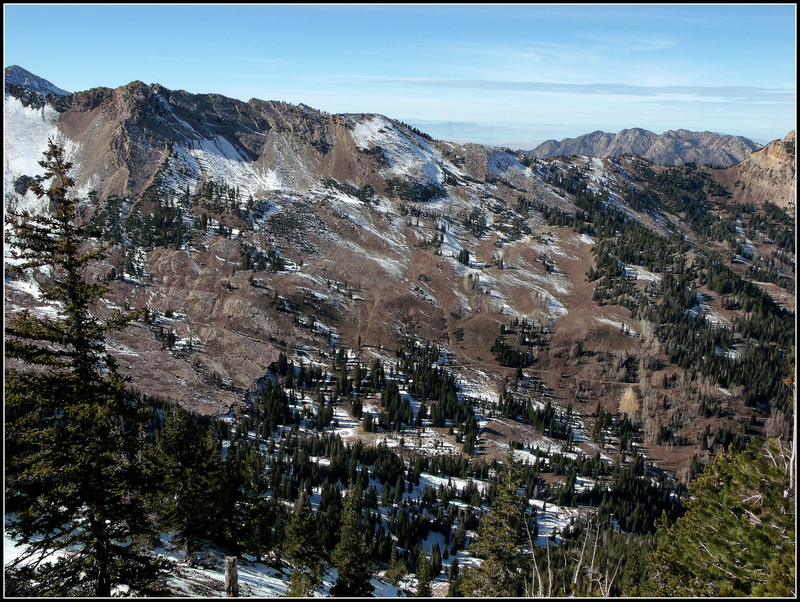 Big Cottonwood Canyon is one of the three major canyons in the Wasatch Mountain range that creates a beautiful and natural eastern boundary for the greater Salt Lake City metropolitan area. 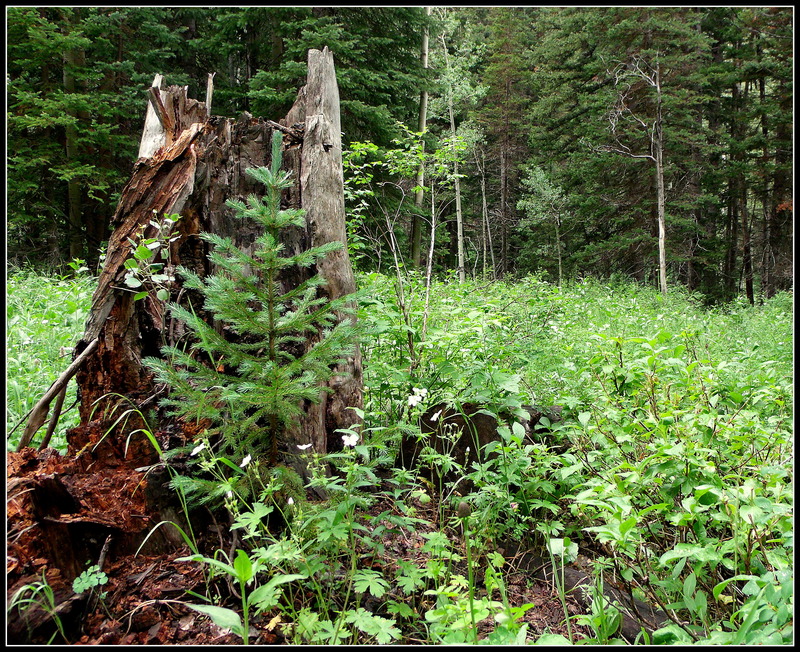 The early years of pioneer settlement saw the canyons being ravaged for their lumber…stands of pristine forest with pine and fir trees that had diameters between three and four feet across were taken down to build houses, supply wood for stoves and furnaces, and for developing industry. 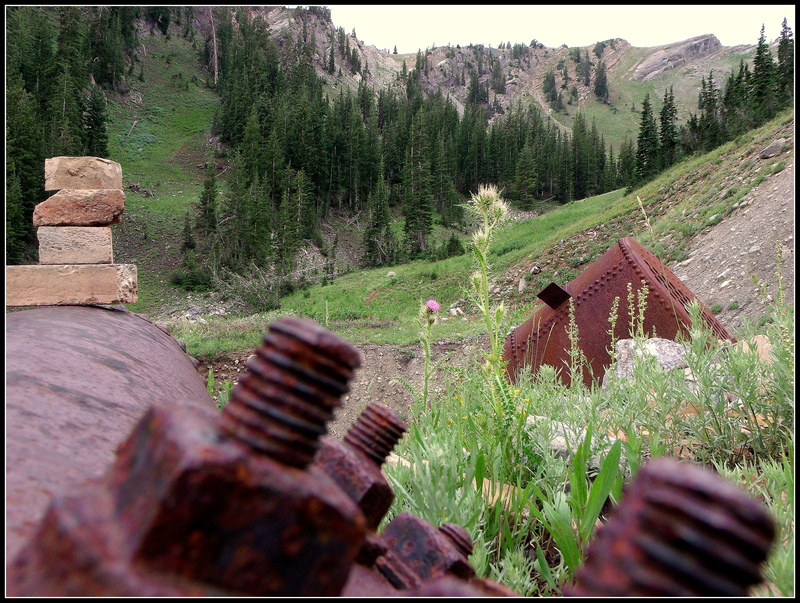 As the years passed, and as the political climate of the Salt Lake area changed, exploitation of the canyon’s natural resources continued in the form of mining for precious metals. The early 1860s saw numerous individuals and companies filing claims with the local courts so they could dig into the mountainsides and remove what they might…often packing the ore down their constructed roadways with wagons and mule-carts, and later with narrow-gauge railcars, depending on their location. 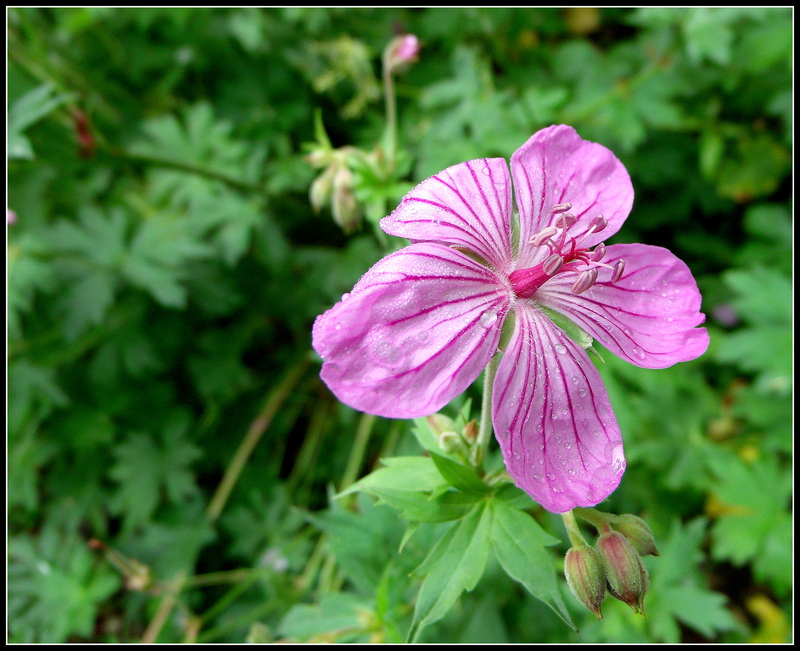 The pretty flower shown below is a Sticky Geranium. 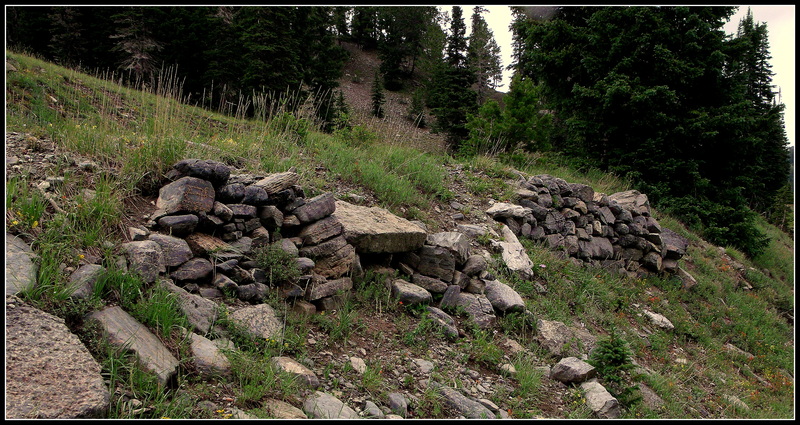 If you looked at a map of the area’s canyons today, you would be able to identify gulches, tributary canyons, and various forks in the mountains by the names of people who had filed either mining or lumber claims in the particular areas…or had built a road into the woods and charged a toll for each wagon load of lumber…or who had been the “first” (Anglo?) 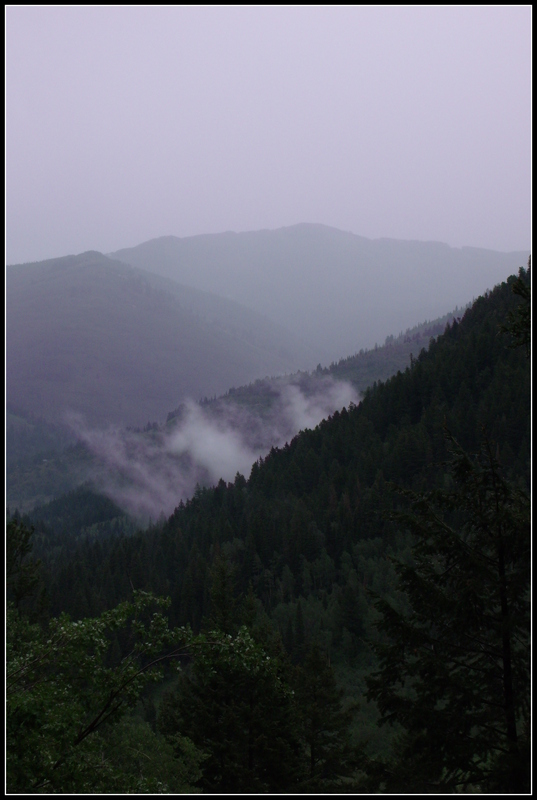 to explore particular peaks or ridges…or had been a mine superintendant…or…. 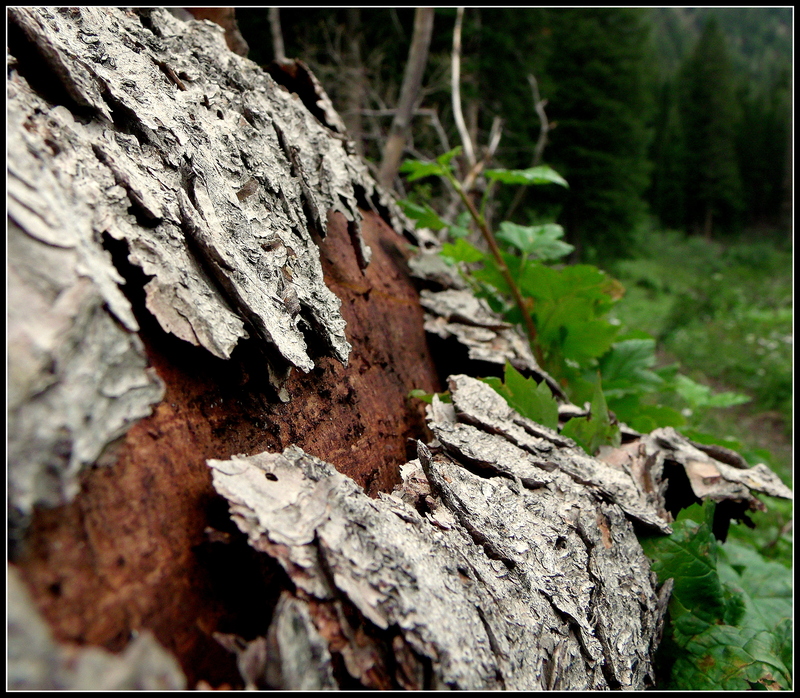 Albion Basin, near Alta, at the end of Little Cottonwood Canyon, received its name from the Albion Mining Company; Alexander Basin in Millcreek Canyon was named after a man and his sons who harvested trees from a particular slope…and Days Fork was likely named after one of the Mormon settlers who filed a mining claim in the area. 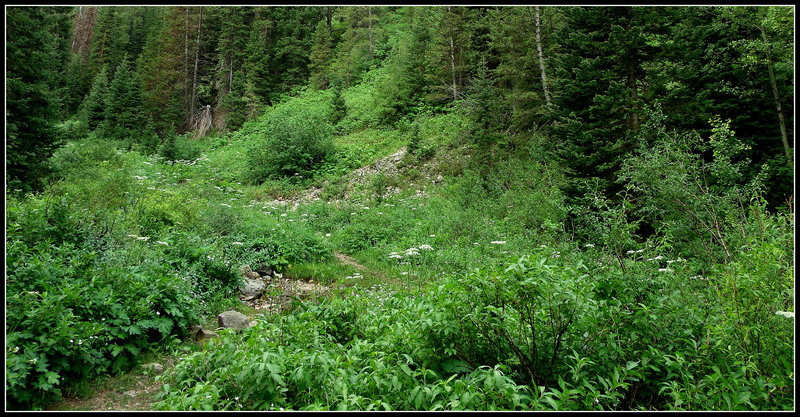 Day was a common name among the pioneers, but it is not known which particular one filed the claim in this tributary canyon of Big Cottonwood Canyon proper. Those blurred and brownish cone-looking things in the below photo are Western Coneflowers…they’re part of the Sunflower family. The eventual goal of this and the next two posts is to share my hike up the three-plus mountain miles that lead to the Days Fork mine near the canyon’s terminus; I could just share the pictures of the abandoned mine site, but as with many other pursuits in life, it’s not so much the destination that counts, as it is the journey that takes us there…. I’m told that the brownish, chewed-off branches or sticks that you can see in the photo below are actually young willow trees…a favorite snack/meal of the moose who wander the area. 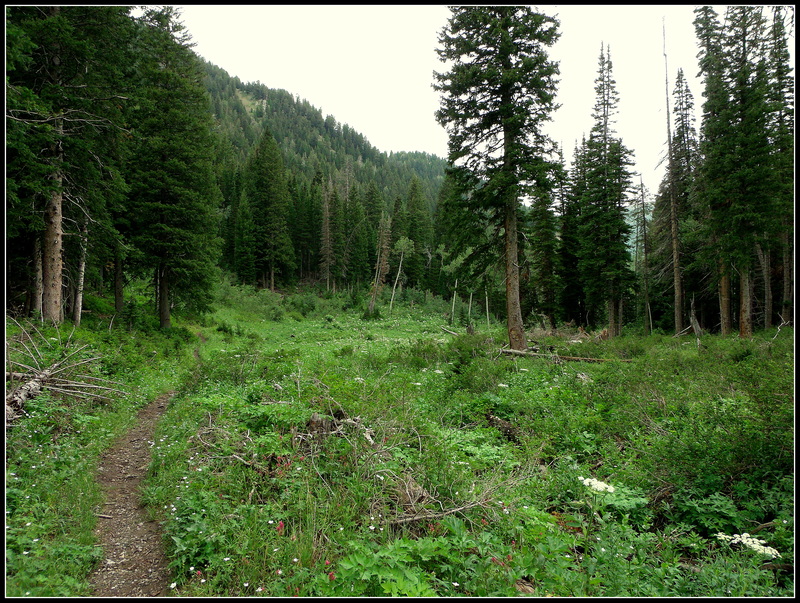 For those of you who are interested, the trail is reported to be three and a half miles in length and gains 2,000 feet in elevation from start to finish, ending at 9,400 feet. 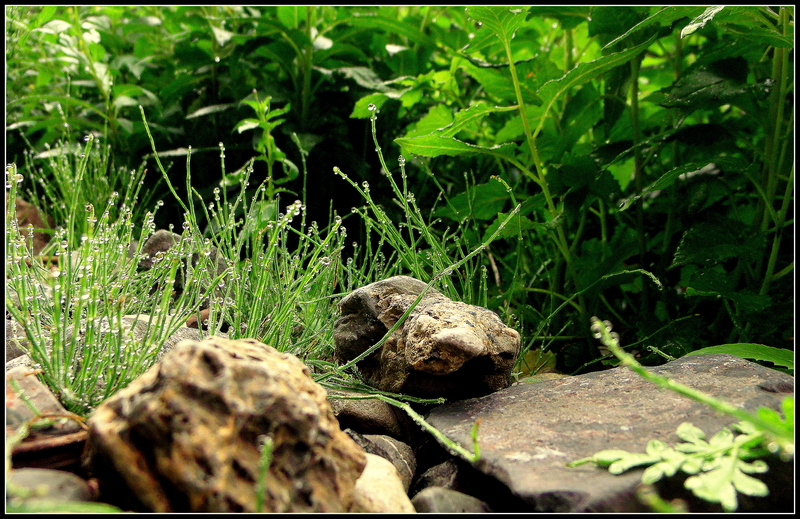 I had hoped to capture interesting images of the rocks that you can see in the above trail…but ended-up with the below image of one part blurred rock, one part not-blurred rock, and one part beautiful water-droplets-on-grass-blades from the previous evening’s rain. The historical information I mentioned above can be found in The Lady in the Ore Bucket, by Charles L. Keller…a retired engineer and an avocational historian who still leads hiking excursions into the local canyons…at more than 80 years of age…. 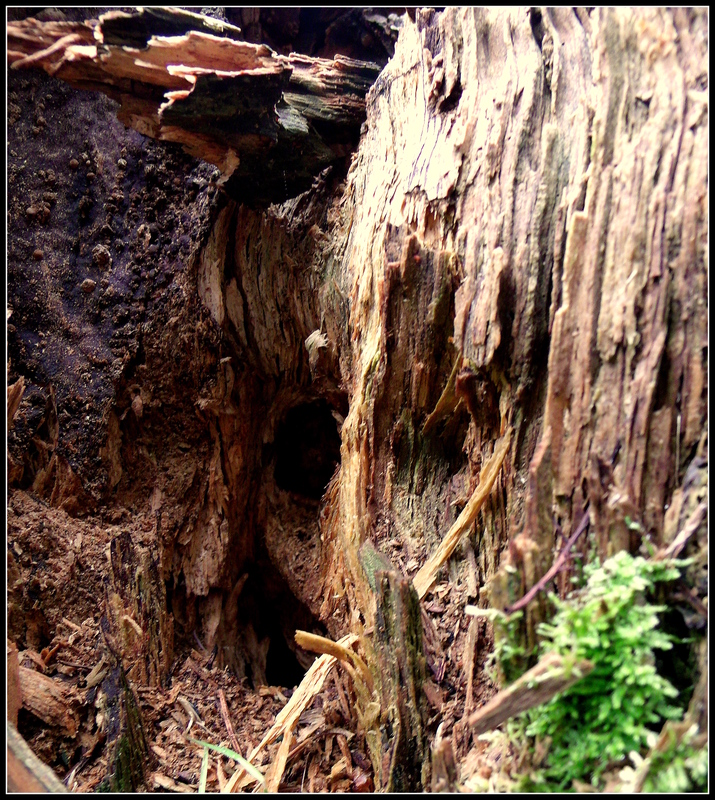 I am still struck by the beautiful examples of the circle-of-life that I find on my canyon and mountainside hikes…like the sapling that is growing next to the broken trunk of an ancient tree that is slowly returning to the earth…its minerals nourishing the new tree that will take his place in the forest landscape, providing food and shelter for the small animal life and recycling life-sustaining elements that will be used again and again by his forest neighbors. 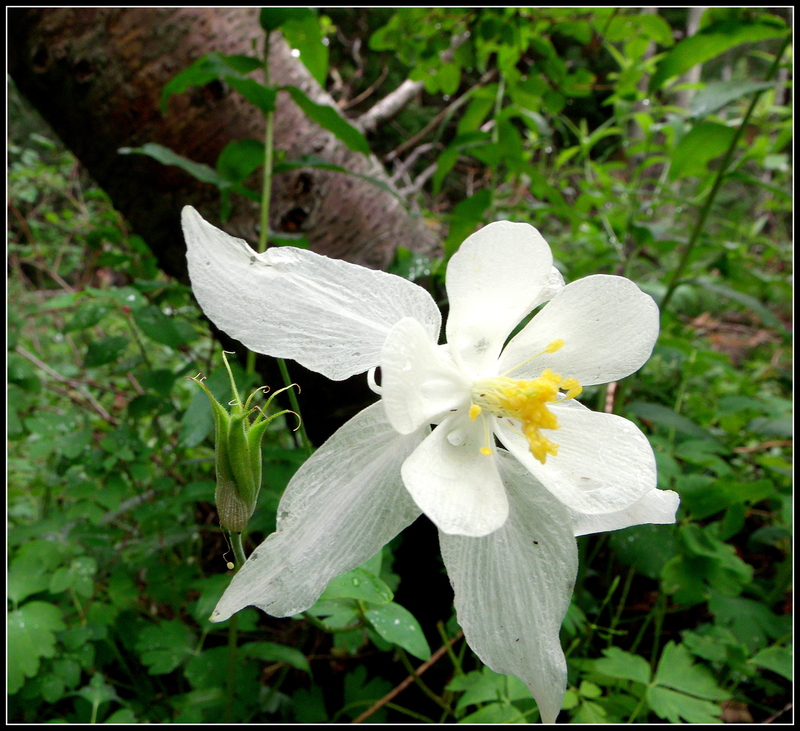 The above flower is a Colorado Columbine…a weighty name that evokes memories of a horrible event in our modern history of America…. I often find the flower standing alone, or with only a couple of blossoms on a single plant…making me wonder how it got there and why there are no others around it. I understand seed dispersal through winds and bird/animal droppings, but it still strikes me as strange that there aren’t more together, or at least nearby, when I find one or two of these alluring and beautiful flowers. 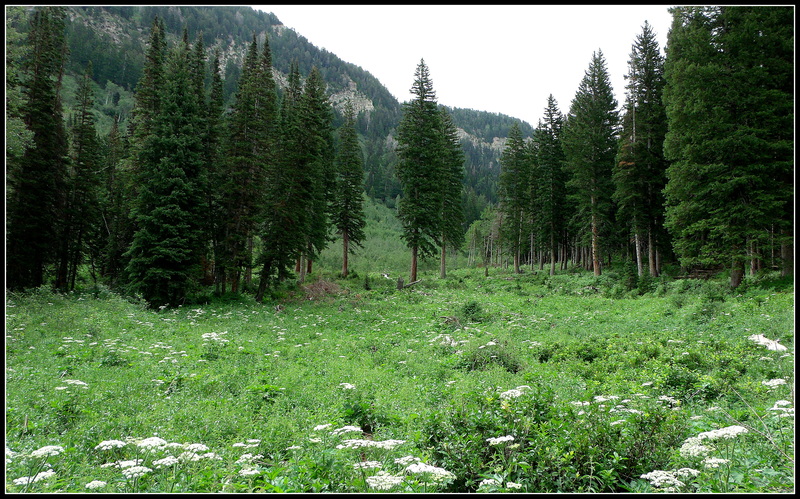 You can see the large white patches of Cow Parsnip in the mountain meadow shown below…beautiful umbellifers that can grow to several feet in height after particularly wet winters and springs. Can you imagine standing there on the trail with me…absolutely nobody else around for at least a couple of miles…or more…? 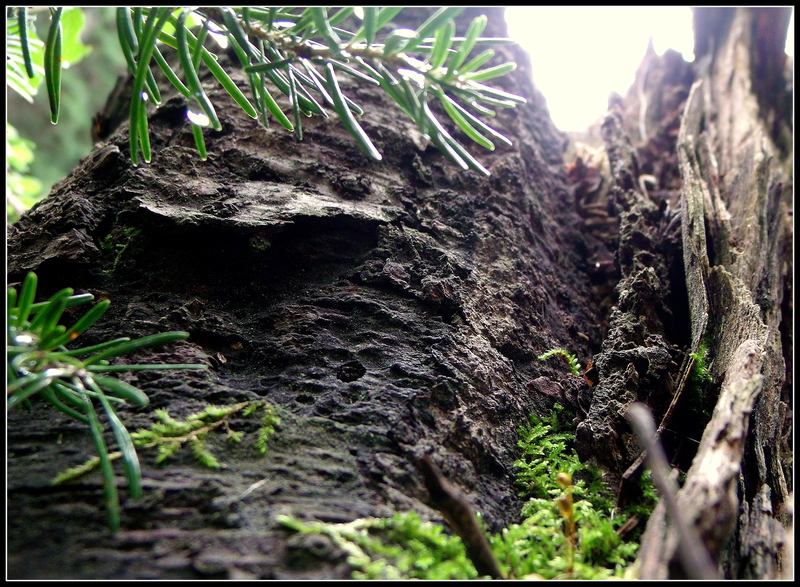 A slight breeze stirs the pine branches overhead…causes a ripple in the wild grass and flowers in the meadow…and brings the scent of wet forest mulch, like a natural perfume rising from the earth itself…. 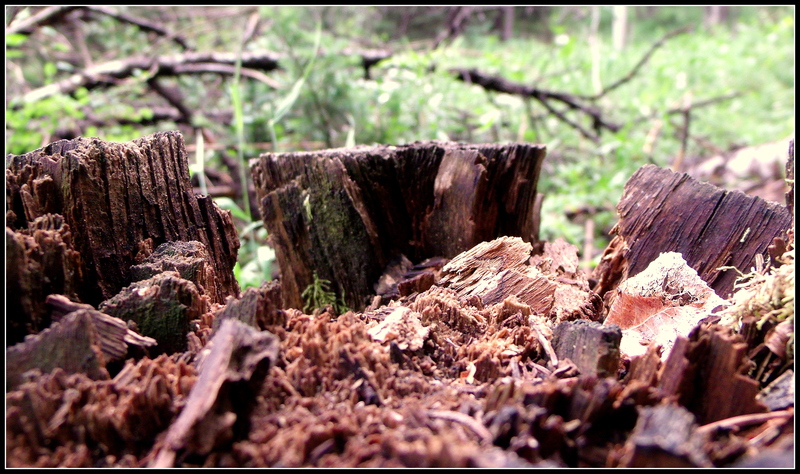 Life on a Tree Stump…. There were blue and green and red and black lines on the map, the glossy finish reflecting the overhead office lights, the solid red light illuminated on the nearby phone telling me that a voice-mail message was waiting…and waiting…. 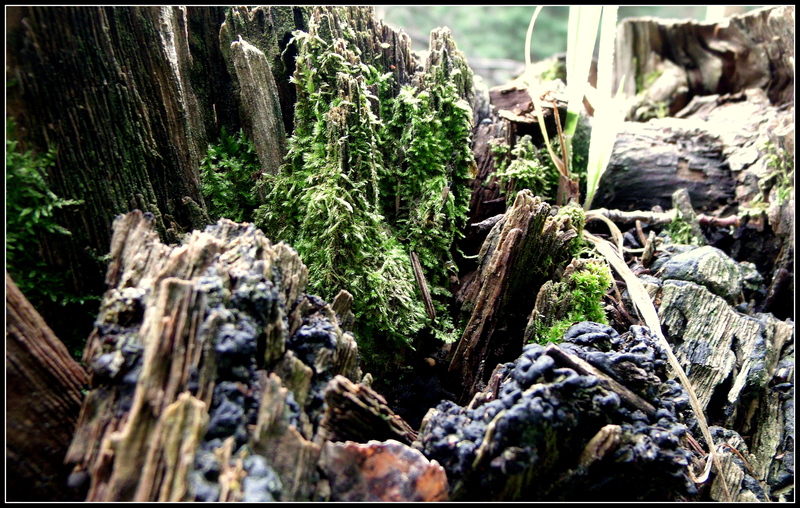 …life on a tree stump…. 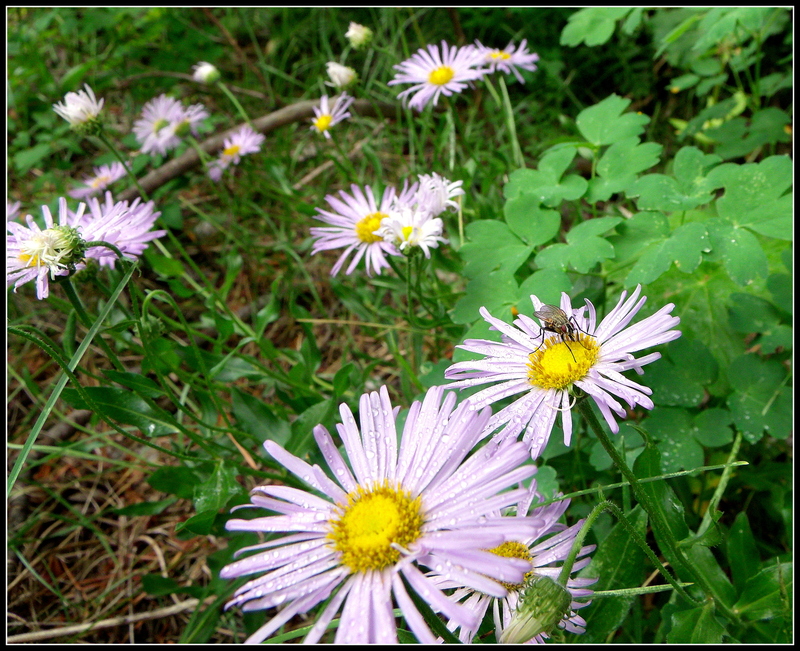 Thank you for visiting with me…for staying a while…sharing my world….